As part of its bauma 2019 product lineup, Terex Aerial Work Platforms (AWP) will be showcasing the new Genie GS-4655 scissor lift on booth n° FM 711. The latest addition to the brand’s large electric slab scissor lift family, this new eco-friendly machine comes in a compact, lightweight package and combines maximized productivity with increased battery runtime and reduced service costs. Equipped with the latest generation of fully sealed AC electric drive motors for excellent ‘green’ efficiency, it is even suitable to meet the demands of indoor and outdoor access tasks. This new model will be available globally in Q3 2019. Providing a maximum indoor working height of 16.02 m (52 ft), maximum outdoor working height of 10.70 m (34 ft 6 in), a class-leading horizontal outreach of 1.22 m (4 ft) with fully rolled-out deck extension, as well as 25% gradeability and 14° breakover angle to climb steep ramps and make transport easier, the new Genie GS-4655 scissor lift offers a 350 kg (770 lb) lift capacity for up to three people and their tools and materials. 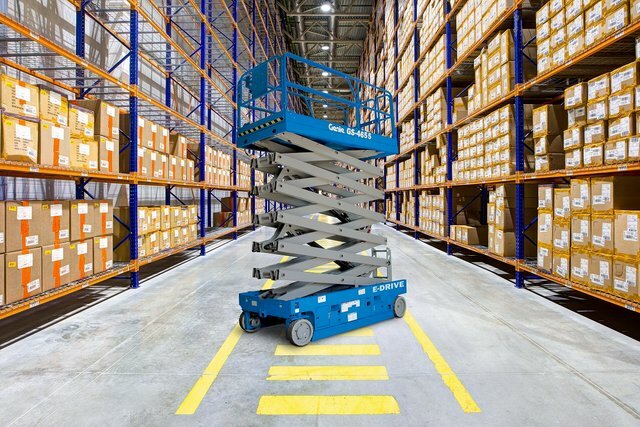 With its narrow 1.40 m (4 ft 7 in) chassis width, weighing 3538 kg (7800 lb) it has been engineered for high access in restricted spaces, the Genie GS-4655 scissor lift features the latest generation of AC electric drive motors for excellent indoor and outdoor efficiency. Ready for use anywhere globally, key applications for this new model include narrow aisle warehouses, electrical installation and facilities maintenance tasks, as well as demanding tilt-up and heavy-duty construction jobsites. “Thanks to its heavy-duty, fully sealed front-wheel AC electric drive motors, the new Genie GS-4655 scissor lift is designed with sustainability, productivity and a low cost of ownership in mind. We engineered this model to deliver the height and emissions-free power to work indoors and out, even in harsh outdoor jobsite conditions,” Zach Gilmor, Genie Product Manager, Terex AWP for the Europe, Middle East, Africa (EMEAR) says. The proven Genie Smart Link control system simplifies troubleshooting with onboard easy-to-read and user-friendly machine adjustments and onboard diagnostics, reducing downtime and maximizing rental return on invested capital (rROIC). For more information on Genie, roll through this link. Large!